Edward Pham – Random thoughts and opinions from an ordinary individual with extraordinary dreams. If you hadn’t heard about the U.S.’s failure to qualify for the 2018 World Cup, it was definitely shocking news to say the least. Qualifying from CONCACAF with a team that US Soccer has should be pretty simple, right? Well, they proved us wrong, which leads to this topic: What went wrong? And could this be a potential trend? Blame it on the managerial staff? It’s easy to blame it on the likes of Bruce Arena, who to be honest, did a lot better than people probably expected given he was put in charge midway into the qualifying campaign. The game against Trinidad was atrocious though: The tactics, the lineup, the misplays, the lack of urgency. They were all amiss. But that’s only just one game. People will go back to saying “Jurgen was a better manager,” but his tactics and use of players were poor as well. I think we need to look at the bigger picture. It’s not necessarily the leagues themselves as the quality of the leagues that are of concern. When you look at the USMNT squad’s numbers, it’s rather terrifying. While yes, they did have a lot of players from the MLS (17 of them to be exact), 13 of them were 30 years or old, which is staggering for a team that wants to be among the top tier teams and leagues in the world. For reference, a lot of soccer analysts consider 23 or 24 or under to be a “young player.” In the case of the US, there were a total of five that were considered young players on the roster: DeAndre Yedlin, Bobby Wood, Paul Arriola, Kellyn Acosta, and Christian Pulisic. Compare this to France’s roster, where there were six who were 30 or over and 12 that were 24 or under. If you haven’t known by now, I’m a huge fan of French football. From Ligue 1 to Les Bleus, it’s something I love talking about. A lot of it has to do with the development of the youth there. I’ve briefly mentioned about it before with OL and seen it with other teams like Nice, Monaco, Le Havre, for example. Every year, a website called “French Football Weekly” does something called “Le 50,” which covers the top 50 young players to watch. A lot of them being French players. And not necessarily on the big clubs like OL, PSG, and Monaco. But there’s been this constant pipeline of talent that comes through year after year after year. It’s not so much the aging players, as the thought of the youth that’s incoming for the US. The fact that only five were of enough quality to be able to make it onto the squad to take on Panama and Trinidad and Tobago is what is of concern. The prospect that there aren’t young players good enough to replace an aging Tim Howard or Clint Dempsey says something. What does it mean for the future of US soccer? Youth is an integral part of any professional or national soccer team. The game has gotten stronger, faster, and smarter. Just like it’s harder to teach an old dog new tricks, it’s more challenging to adapt an older player to an evolving game. That’s why there’s been so much more emphasis on youth. While we primarily hear about Messi vs. Ronaldo, who are in their 30s now, it’s the young players like Isco, Marco Ascensio, Kylian Mbappe, and the like that are making an impact. The game is evolving. You need players that can adapt quickly, else you fall behind. Youth helps combat this. But this is where the US national team has struggled. What’s constricting us from finding young talent and are they valid arguments? The “pay-to-play” model is definitely a concern. It’s been spreading like wildfire across social media. To play soccer in the United States is a struggle because of costs. To be on a club team and get recognized for your talents requires a lot of money. There isn’t a real solution to curb costs and as a result, sometimes, such talent won’t be found. But that means that talent is out there. It just has to be found and recognized outside of the club level. Then you hear the arguments of “Build more academies!” Well, there have been and there’s been some success. However, they’re also expensive and outside of maybe MLS teams, it’s hard to just build them. They cost a lot of money and requires investors. And a lot of the time, such investments don’t see much fruit until later, which some people don’t have such patience for. And there are some academies that are also of the “pay-to-play” model, which goes back to an ongoing problem. So what do you do to fix this problem? Paul Tenorio brought up better coaching education. What does better coaching do? Brings up better talent, for certain. By having more coaching available, it makes it so that you can develop more talent and increase your talent pool. But more than just that. They also can identify that talent as well, which is crucial. The more eyes that are around to find these players that aren’t playing at club levels, the better. And I think that’s an issue. We’re so blinded by only looking at the club level, that we don’t find some of other high caliber talent because of uncontrollable consequences like low income, location, or such nor give such talent the ability to showcase their skills to teams and national level scouts. And that’s a shame. In 2016, Iceland made it to Euro 2016, despite their small population of around 330,000. They were the smallest country to ever make it, though people credited them having some fortune (such as the expansion of the tournament). The Guardian did coverage of it last year when the tournament started, but credited it a lot to their coaching . They proved their system and plan wasn’t a fluke when they automatically qualified for the 2018 World Cup from their group, which included Croatia and Turkey. But what did it start with? Improving their coaching staff by getting them their UEFA B licenses and making them more readily available for the youth. It’s worked. Possibly. There were some good things to come from the Trinidad & Tobago game. Despite there being only five players that were 24 or under, they all managed to find some way into the game, impact or not. They did get the trust of Arena to try to get a result. The U-20 team did make it to the U-20 World Cup last year, getting to the quarterfinals before losing to eventual finalists Venezuela. The U-17 national team begins their U-17 World Cup campaign tomorrow in India against Colombia. Youth can be a crapshoot sometimes, that’s for sure. Julian Green hasn’t really made much of an impact since 2014. Freddy Adu, who was suppose to be the next big star for the USMNT, hasn’t even come close to that. It’s hard. But you can beat that by (1) getting better coaching staff to teach them better technique or (2) creating that huge talent pool in the first place rather than just limiting to just a few players. That comes with development. That comes with better coaching. Considering that the United States has a population of over 330 million people, you have a lot of diverse backgrounds and experiences in terms of soccer at the youth level. You need to be able to utilize that, by finding and nurturing those players. It’s a wake-up call for US Soccer and the USSF. They’ll need to make adjustments to accommodate for not only some of the failures in this World Cup qualifying, but for the future and development of soccer in the United States as a whole. The day that the Timbers won the MLS Cup. I was down in the locker room to catch this photo. This was a photo that I had taken on a cold Columbus night in December. December 6th to be exact. It was my sister’s birthday that day too. While I love her to death, it was an opportunity I couldn’t turn down. 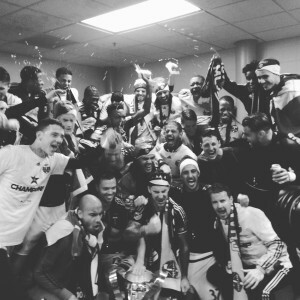 It was the chance to cover the Timbers when they played in the MLS Cup Final. I’m a second generation Vietnamese-American. My parents came to the U.S. in the late 1970s after they had to flee the North Vietnamese when they came into Saigon. Both of them eventually were sponsored by two great families in a small Pennsylvanian town called Oil City, where they were willing to open their homes to individuals who they knew nothing about and to show them love and support. My parents could have been Viet Cong for all the families knew, but they took the risk anyway. I’m so thankful that they did. Many of these governors proclaim their faiths as Christians. They say they love Jesus and God and give their lives to Him. Yet, their actions clearly don’t speak in the same way they love Him as they reject those that need our help, just because they fear that one of those refugees could be like one of those suicide bombers in Paris. Jesus didn’t reject his love or choose not to offer his help because they were sick, poor, a prostitute, or anything else for that matter. He didn’t care what someone’s status was. He loved people unconditionally. Even when he was nailed to that cross by his enemies, He told God, “Father, forgive them, for they do not know what they are doing.” (Luke 23:33-35) If we’re truly followers of Christ, shouldn’t we do the same? Shouldn’t we show the same love to those refugees as much as we do our own friends and family, whether it be through financial aid or even opening our own borders and homes? The reality of all this is by closing the borders, the enemy wins. Refugees have no place to go and to not give them a place to seek that refuge, the enemy takes pride and joy knowing that. They know their work is being done and their actions have put fear into us. After the attacks on Paris last Friday, French President François Hollande spoke to the mayors of France and told them that they’ll continue to take on 30,000 refugees despite the events and the seeds of doubt. He called it a “humanitarian duty” to help them. He received a resounding ovation. Yet, here we are in the United States, relatively unaffected by those attacks and closing our borders, doing it out of fear. If we truly say we’re in Christ, then it needs to be more than just saying “I’m a Christian.” We need to show it in our actions as well. These actions, however, are just a slap in the face to not only the principles of this country, but a slap in the face to God as well. EDIT – I guess I should specify more about the two families. The major sponsor was the Lutheran Church, but two families were particularly kind and took in my parents as though they were family. Soccer has been so much about acquiring and developing the perfect squad: A invincible defense and a dynamic and deadly offense. But in our current age of soccer, the best way to do that? Money. You have a weakness somewhere on the pitch? You buy a player that can fill that gap. However, not every club can afford to spend extravagant amounts of money to buy that star winger like Arsenal did with Alexis Sanchez or a playmaker like Chelsea did with Fabregas. Sometimes, you have to look within your own system to really get that going. Barcelona comes to mind. With La Masia around, they’ve been able to bring up players like Iniesta, Messi, Xavi, and the likes up to command and be in the top ranks of La Liga and Europe. But as of recent, they’ve went with the “pay big to win” route, acquiring the likes of Neymar, Luis Suarez, and Rakitic to combine with Messi and paying a hefty amount for them. So it brings up the topic of this post… Why should you be following Olympique Lyonnais? In a time where we’re so much focused on buying players to meet the immediate needs for clubs and be able to be successful in the top five European leagues, Olympique Lyonnais (or better known as either Les Gones or l’OL) has been a breath of fresh air. It was in a game last season that eight of the players of starting eleven that played came up from the youth ranks. It definitely requires patience (see the first four games of this past season, their elimination from Europa League qualifying to a small Romanian team, and their struggles in UCL this season). However, they finished second in Ligue 1 and secured themselves a place in the Champions League group stage. It all started with their focus on their academy and developing their youth. Without a management that’s willing to be patient with the process, this wouldn’t be possible. A great article from Andy Brassell covers Jean-Michel Aulas’s vision and changes to the entire structure illustrates why Lyon needed to rely on their youth. With the desire to build a new state-of-the-art 60,000 capacity stadium, they couldn’t afford to maintain high salary profiles or be spending year after year. As a result, it required that they focus on bring up youth into the senior squad over time. Now they’re reaping the rewards of it. But what’s more important is as a whole for the country. While England struggles to bring up youth for their senior national squad, France have players that they can rely on in the likes of Alexandre Lacazette, Corentin Tolisso, Nabil Fekir, and Maxime Gonalons, all products of their system. It’s a formula for success that teams across the world should be looking at, for the sake of their club’s financial health, but also to help with supplying the national team’s future stars. It’s not to say that clubs shouldn’t spend money (Lyon spent €5.5 million for Claudio Beauvue, €12 million for Serge Darder this offseason). But ultimately, to have a team like this win a major trophy through primarily off their youth would be great for the game. It’ll give clubs that don’t have that kind of payroll a model to work off of and be able to work their way up the ranks to the top of the table in their respective leagues. Lyon remains competitive in Ligue 1 this season, as they are in second place behind major spending club Paris Saint-Germain. They continue to be thrifty on their spending compared to most clubs out there. But as 2016 comes around, their youth will come into their new stadium and bring home new silverware and celebrate with the fans that have been loyal throughout this process. Keep an eye out for these kids, or even better, root for their continued success. Fast-forward to ten years later, I sit here at the research office, staring blankly at my laptop screen. I never thought that I’d be here, working on trying to detect patients at risk of lung cancer through their medical records through NLP software. Though I can’t turn back time for my mother, I know I can still make an impact in the lives of others through this project. 2014 was definitely one of those years with a lot of reminiscence for me. It was hard for me to admit that my mother had been gone for ten years. Ultimately, those events in Chicago changed my outlook on how I viewed life and also where I am now. … The night before the quarterfinals, I told my friend, “Whoever came out of the bracket between Brazil, Colombia, France, and Germany victorious would win the World Cup.” My belief there was that they were the four most convincing teams thus far in the tournament. They were assertive in their attack and calm and collected in defense. … The Brazil/Chile game was really surprising to me. Good chances, good opportunities for both teams, but they weren’t able to capitalize. It was tough to have to see one of the two teams get knocked out via penalty kicks. Julio Cesar still showed he’s among the best in the world in terms of goalkeepers, making two huge saves. Coed soccer has been a popular sport in the greater Seattle area. I jumped onto the scene seven years ago as a manager of a team consisting of our IMA intramural soccer team at the UW. It’s undergone a lot of changes, with people coming and going. At one point, it had to go under a complete rework and I had to start all over (had one person returning, but I put in the effort to make it happen). I started to apply the solutions to the mistakes that I made or problems that I dealt with and it’s resulted in probably the most successful team I’ve managed in my seven years as a manager.